If you have been injured in an accident with a commercial vehicle, contact a Los Angeles truck accident lawyer at The Reeves Law Group. Our experienced attorneys have been helping victims of truck accidents throughout Southern California for over 25 years. If you have been hurt in an accident involving a commercial truck, determining what caused the accident, who is responsible, and how to be compensated for your suffering are complicated questions. Commercial trucking accident lawsuits may involve many parties, including the driver, the owner of the truck, the truck manufacturer, and the owner of the transported load. A skilled truck accident attorney will have the ability to reconstruct how your accident happened and determine whether you have a valid claim for compensation. This article outlines key aspects of truck accidents and what an accident victim should do to protect their legal rights. If you need to consult with a truck accident lawyer in Los Angeles, contact The Reeves Law Group today for a free consultation. For our clients’ convenience, we have meeting locations throughout southern California. The Reeves Law Group helped me out of a really difficult situation and I am so glad I worked with them. I was driving through Chino on my way to work when an 18 wheeler changed into my lane and crashed into me. I went head first into the center divider and ended up facing backwards on the 60 freeway. It was by far the scariest/worst thing that has ever happened to me. I had a neck injury and was not able to work for an entire year. To make it even worse, the big rig took off after hitting me! I hired the best truck accident lawyer I could find, which was the Reeves Law Group. Truck accident attorney Blaise Patzkowski represented me. When the trucking company did not even offer to pay for my lost earnings, Mr. Patzkowski filed a lawsuit against them in the San Bernardino County court. I really think he put the fear of God into them because they paid a very large amount of money to settle my case before trial. I know first hand now that the Reeves Law Group has the best truck accident lawyers in San Bernardino. Punitive Damages – if the trucking company’s intentional or reckless acts contributed to causing the truck crash that injured you. Anyone who has been involved in a truck crash knows that a truck accident is not like a common car accident. Commercial trucks cannot stop as quickly or maneuver nearly as well as a car can. The destructive combination of a semi-truck’s large mass and speed, along with the potential to impact many smaller vehicles, make the damage caused by an out-of-control truck much greater than most other highway accidents. If you or a loved one have been injured in an accident with a semi or commercial vehicle, contact the Los Angeles truck accident attorneys at The Reeves Law Group today! After being involved in a commercial truck accident you are likely to feel overwhelmed. Thinking clearly when you are scared and injured may be difficult. Obtain Prompt Medical Attention: If a truck crashes into your car, you and your passengers have likely suffered injuries. You may find yourself insisting that you don’t need medical attention to find and treat any accident-related injuries. Nevertheless, at a minimum you should obtain a prompt medical examination. Unseen internal injuries, like brain damage and spinal cord injuries, can go undetected, sometimes with catastrophic results. In addition, by not seeking medical attention soon after an accident, you may lose the chance to document the cause and type of your injuries, making it difficult for your attorney to help you prove that the truck accident produced your injuries. Preserve Evidence from the Accident Site: After a truck crash, it is important to preserve not only evidence of your medical condition but also evidence of what happened at the accident scene. The trucking company may have a rapid response team of experts and attorneys at the location almost immediately. They want to get critical measurements and photos before the vehicles and debris is cleared – which may happen before you can take them. Usually, the police will take crash-scene photos before the site is cleared. If not, request that they do so. If your condition permits, take pictures of your own, (remember that most cell phones have picture-taking capabilities). Subtle clues from these photos may help your truck accident attorney’s experts reconstruct critical evidence that can help explain exactly what happened when that semi-truck or 18-wheeler collided with your car. Preservation of the Vehicle: If anyone has suffered substantial injuries or death, it is very important that that you also preserve your vehicle until you retain a lawyer. The attorney should determine, with experts if necessary, whether there has been a defect with the vehicle or its parts that may have contributed to any serious injuries suffered by the vehicle’s occupants. Contact a Lawyer Experienced in Truck Accident Cases: The stakes in a truck crash case can be very high, because of the potential for substantial injuries and other damages. Trucking companies hire experienced attorneys who specialize in truck accident cases to fight liability and limit their damages. You will need a skilled and experienced truck accident attorney representing you as well. Your lawyer must be able to hire investigators, preserve evidence as needed, and communicate effectively with trucking companies, police, witnesses and your medical care providers. A semi-truck, 18-wheeler, or other large truck is capable of such destructive force that increased care and attention to safety issues is required, in order to avoid potentially catastrophic trucking accidents. Truck drivers, even more than car drivers, must constantly be attentive, alert, and in control. To protect other vehicles on the road, commercial trucks must be in superior condition. California law requires it. With the constant vigilance required by law and common sense and the safety standards imposed by truck manufacturers and shipping companies, how do hundreds of thousands of truck accidents happen each year? Usually an accident is caused by carelessness and poor judgment. Driver Fatigue: A 1995 government study concluded that the main cause of truck accidents is driver fatigue. The Federal Motor Carrier Safety Administration has established regulations to limit the number of hours a truck driver may drive per day or week to reduce this problem. States may set lower limits for maximum driving hours. Regardless of the legal driving-time limits, truckers have a personal responsibility not to drive tired and cause a truck crash, due to fatigue. Substance Abuse: Drug and alcohol use can be a factor in truck crashes, just as with other injury-causing accidents. Trucking companies are legally bound to investigate drivers before hiring, and to monitor them afterwards, to minimize the probability of substance abuse that could cause a truck accident. When drug testing is carried out by employers, studies have shown a 9-10% decrease in truck accident fatalities. Speeding: Speeding in a truck or tractor-trailer can have devastating consequences. A truck traveling at 70 miles per hour has twice as much energy as a truck traveling at 50 miles per hour, as well as a much greater braking distance. According to the National Highway Traffic Safety Administration, more than one-quarter of all drivers of large trucks, like semi-trucks and 18-wheelers, involved in fatal truck crashes in 2004 had at least one prior speeding conviction. Improper Loading: Improperly loaded cargo may place the load’s center of gravity too high, making the truck or trailer more likely to tip over. Too much weight toward the front or back of the load may also adversely affect the truck’s handling, making a truck crash more likely. Improper Inspection and Maintenance: Brakes, lights, and other safety equipment must be properly inspected and maintained. A study by the Commercial Vehicle Safety Alliance found that 1 in 5 trucks failed a safety inspection; failures included defective brakes and tires, which could cause a truck crash. Product or Manufacturing of Trucks: The poor design or manufacture of a truck, or another vehicle involved in the truck accident it collides against, may cause or intensify the consequences of a truck crash. An occupant of a light truck involved in a truck crash may have fallen victim to a known design defect that causes rollovers. A truck crash may involve a passenger car sliding underneath a semi-truck, with horrific consequence. Proper design and manufacture can prevent truck accidents involving these causes. 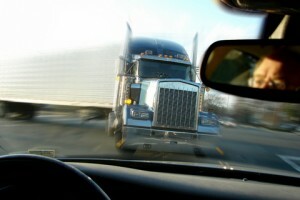 Employer Negligence: A trucking company that neglects to carefully hire, train and supervise its drivers and maintenance staff may contribute to the cause of a truck crash when a driver falls asleep at the wheel of a semi-truck after being asked to drive too many hours, or when the brakes on an 18-wheeler fail because an untrained maintenance worker adjusted them incorrectly. According to the National Highway Traffic Safety Administration, a “large truck” is one weighing more than 10,000 pounds. An 18-wheeler tractor-trailer can weigh more than 80,000 pounds. A semi-truck or 18-wheeler rig can weigh 40 times as much as a car. That is about the ratio of a large professional football player to a newborn infant. A large truck, traveling at a high speed among smaller vehicles is inherently dangerous, especially to a car’s driver and passengers. In the approximately 416,000 large truck accidents that occurred in the United States in 2004, more than 5,000 people died and 116,000 people were injured. 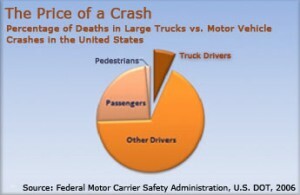 77% of those victims killed and 73% who were injured were in vehicles other than the truck. Just as truck crashes are not like car accidents, truck accident cases often involve greater injuries and pose legal problems and concerns not found in most car accident cases. That is why it is important that anyone injured in a truck crash obtains help from an attorney with experience and proven expertise in litigating truck accident cases. Parties to the Truck Accident: These can include the truck driver and drivers of other vehicles who may have contributed to the trucking accident. Defective Products Manufacturers and Retailers of the Truck: Product defects that are present when the truck, its tires, engine parts or other components were manufactured can contribute to a truck crash. Employers of the Truck Driver: The owner of the truck or trucking company may not be at the wheel when the crash occurs, but that owner may be liable for the truck driver’s negligence. Sometimes, the owner may also be potentially liable for punitive damages when the conduct of the owner is particularly egregious. For example, if the trucking company cut corners by requiring drivers to drive too many hours, leading to driver fatigue and a truck accident, this may lead to additional damages imposed on the truck company, in the form of punitive damages. An effective truck accident lawyer can identify the responsible parties and determine if they followed applicable rules and regulations designed to prevent truck crashes. Repair Facilities Responsible for the Truck’s Maintenance: A repair facility that made faulty repairs to the truck that collided with your vehicle may have contributed to your truck crash. Your truck accident lawyer should have sufficient resources to investigate and pursue actions against these defendants. Government Entities Responsible for Maintenance of the Roads: Truck accidents may occur because the government has failed to ensure that the road would not be dangerous for prudent drivers. Some truck crashes may have been preventable, had guardrails and other safety measures been in place. Your attorney should investigate the history and condition of the truck crash site. Falsification of Records: Companies may pressure truckers to falsify logs showing how long they have been driving without a rest. This pressure can lead to drivers being overworked and fatigued, which can result in accidents. Not all lawyers know the tricks the industry uses to reduce apparent drive time. A truck accident attorney should know how to discover if driver logs have been falsified. Similarly, a lawyer must be able to decipher hidden messages in company manuals that convey a company’s real (sometimes illegal) expectations about how to perform the job and how much to drive. Trucking industry support services sometimes facilitate log falsification, and thus truck crashes. For example, fueling stations have been known to refrain from printing the time of purchase on driver receipts, which if printed could help determine how much a trucker was driving. An experienced attorney will know how to uncover these scams. Company Rules Set Down on Paper But Not Followed: Federal and state regulations that are designed to reduce truck crashes by discouraging and preventing truck driver substance abuse are sometimes ignored. Attorneys experienced in truck accident litigation can identify deficiencies in the design and implementation of company procedures. Several Parties In Control of Equipment: Tracing the origins of an equipment failure can be difficult, considering the fact that something like a bad brake might have come straight from the truck’s manufacturer in that condition, might have been replaced in a shoddy manner or might have been maintained improperly. An experienced attorney will partner with a team of investigators and experts to pin down the cause of the brake failure and place blame for the accident on the appropriate parties. Litigation Financing: Government entities and large commercial trucking companies have extensive financial resources to vigorously defend themselves against claims and property losses. Your attorney may need to hire technical experts to identify the appropriate defendants in your case, analyze their level of responsibility and prove to a judge or jury that you, as the victim of the truck crash, are entitled to recovery. In serious or catastrophic injury cases, costly medical experts will also be required to show the extent of your injuries. Prosecuting a truck accident claim is complicated and requires the use of many resources. You should select a lawyer whose firm not only has ample financial resources to fight large and well-financed defendants, but has consistently shown a willingness to use its resources vigorously to obtain optimum results for victims. The Advantage Goes to the Swift: The trucking company probably had its representatives at the scene of the truck crash almost as soon as the accident happened, whereas you may have been slow to act due to your injuries or shock. The most effective way to counter a trucking company’s early advantage is to obtain effective legal representation, without delay. Preserve Evidence: It is important to preserve evidence as quickly as possible. Critical evidence, like driver logs, computer records and on-board “black box” data – which can be decisive in proving why a truck accident occurred – must be secured before it is destroyed or disappears. Federal regulations permit trucking companies to destroy driver logs and other essential data after only six months. These items are often vital to lawyers and accident reconstruction experts in determining the causes of the accident. They should be retrieved and safely stored by your attorney while they are still available. The Reeves Law Group has extensive experience and expertise in all types of vehicular accidents, including truck accidents and tractor-trailer accident cases. We have obtained many substantial and favorable results for our clients. If you have been in a trucking accident and need an immediate consultation, please contact us today.